Activist, researcher, grandmother, friend and confidente. I left my role as CEO of SPAN (Single Parent Action Network) in 2013 to work on co-produced research with communities. However from my continued involvement with the Women’s Budget Group, I know that one-parent families and black, Asian and minority ethnic families continue to be the hardest hit by austerity. What has recently shocked me to the core is discovering the toxic intersection of Universal Credit, Sanctions, the Benefit Cap and the Requirement to Work on single parents with children under 5 years old. As many of you will know, Income Support requires single parents to look for work when their children are 5 years old, but Universal Credit has reduced that requirement to when children reach 3 years old! Not only can single parents be sanctioned if they are seen not to comply, they can also have their benefits capped if they live in high rent areas, a double whammy. One of the only ways of avoiding the cap is if parents work over 16 hours a week, but here’s the rub: Even if their children are under 2, they still have to be working 16 hours or over, whether they are on Income Support or on Universal Credit. The combination of sanctions, the benefit cap and the requirement to work is inhumane. One of the richest countries in the world is not only allowing the youngest children in our care to go hungry, but actively putting policies in place enabling that to happen. Unjust sanctions are also endemic. Gingerbread report that 1 in 7 single parents were sanctioned at one stage in a recent spike and yet 62% of formal challenges were successful. But as everyone knows, those parents who had to manage with huge cuts to their rightful income, go deep into debt, and more often than not fail to recover from the financial repercussions, let alone the stress on their lives and on their children’s lives. What is so distressing is that it doesn’t have to be this way. We could embed children’s welfare into welfare delivery. I know from working at SPAN when Job Seekers Allowance was first introduced, most single parents wanted to work – but not for in-work poverty wages; not in jobs that failed to acknowledge their skills, education and talents; and not in jobs that made time poverty so problematic, it would be difficult for them to parent their children. Time poverty for single parents is greater than at any other period in recent history. The age of a child when a single parent was required to work steadily reduced during a 10-year period - from 16 years old in 2008 to 3 years old under Universal Credit in 2018. Single parents not only have less time for parenting their children, they have no time for further education, voluntary work, training for a better job. Approximately a third of us have escaped abusive relationships – an act of resistance in itself. Friends and family play an important role. However, with the benefits cap, that support can be lost altogether, with families forced to move away from the very support networks that enabled them to work and study. 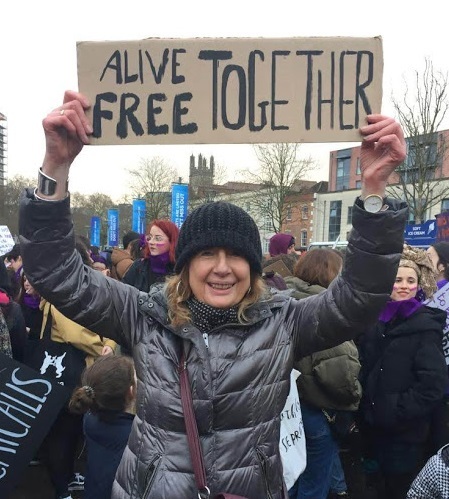 Under austerity, those friendship and extended family networks that helped women/men resist stigma, poverty and violence are more than any time in recent history being dismembered. So what can we do to resist? If you are likely to be capped contact Child Poverty Action Group. The charity has taken the case of two single mothers affected by the benefit cap to the Supreme Court. One of the claimants has children with significant health needs while the other has previously fled domestic violence. Their advice to claimants affected is to lodge a housing benefit appeal immediately requesting for it to be stayed behind the Supreme Court decision. They have a template letter you can use. Across Europe, single parents do better in societies where there is greater equality between men and women. Brexit will only serve to increase inequality. We should be joining with women and equality organisations to work for freedom together, for a new social contract that invests in childcare and time to care, and that sees “children as our future” at the centre of society.